What do you think of this setting? Is this a good place to play football? Why/why not? What are the pros? Cons? Which half/side do you think has the advantage? 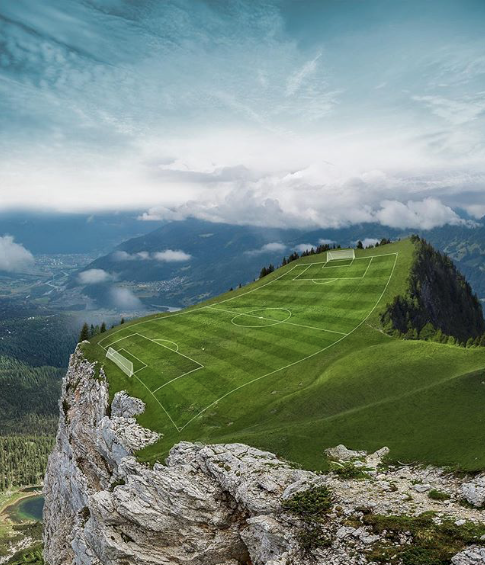 If you were playing here, how would you adapt to this pitch? Why do you think this pitch was built here? Soccer is an alternative word to football; different countries have different name preferences. Ones upon a time there was a great game called football but the football pitch was in a high cliff. There was a football game when the game is over the players went back home it was time for dinner it was fish with rice .finally he finished eating his food he went to bed he woke up early he ate his breakfast and to play football with his friends then he went for lunch with his friends again that day he had a friend free that could go to his house for dinner with him. Once upon a time there was a big football camp and the football camp was on a hill it was a very bumpy one. One day Manchester City vs Manchester United it was the final it was in Ukraine/Kiev. Opening goooooooool was from Aguero he kicked the corner flag 1-0 Manchester City in the lead David Silver past to Aguero and Aguero kicks it in the top of David de Gea goal what a goal⚽️⚽️⚽️⚽️⚽️⚽️⚽️⚽️⚽️ Half time is 1-0 . Now is kickoff for the second half and Stone did not know what to do Lukaku was one a 1 one 1 with Ederson .Should he give the penalty or should he leave it with Ederson. Well he gave the penalty and got a red card🛑 he’s off and it was in the 90’5th minute so Lukaku put the ball ⚽️ one the spot and Ederson went one the goal 🥅 line and Lukaku he had a long run 🏃 and shot the ball ⚽️ BUT EDERSON SAVES’ man city win.the cup.